The day has FINALLY arrived!!!! Conor McGregor and Jose Aldo will FINALLY fight, as we’ve reached the third consecutive and final event to a crazy week of fights in the UFC. It’s almost crazy to digest to the entire card because UFC 194 is flat out STACKED! We got an insane Middleweight Title fight featuring the champion Chris Weidman against the challenger Luke Rockhold. 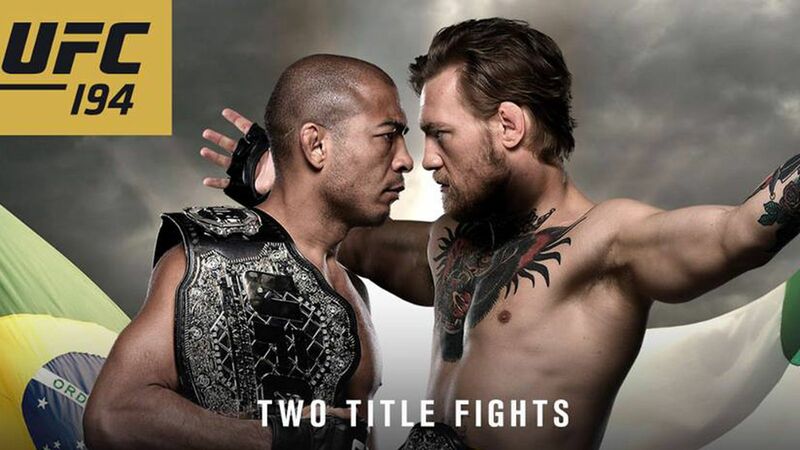 This fight is being slept on due to the fact that Jose Aldo and Conor McGregor are stealing the spotlight, but we’ve had this before very recently…UFC 189. That event was supposed to feature Jose Aldo and Conor McGregor, but Aldo pulled out and in stepped Chad Mendes. The co-main event on UFC 189 was Robbie Lawler and Rory MacDonald and that fight was an absolute war. I think that Weidman and Rockhold are going to deliver, just like that fight did and maybe even better. We also have Ronaldo “Jacare” Souza against Yoel Romero, which conceivable is to determine the next challenger in the Middleweight division. These two have been paired up multiple times, but I think the fight actually couldn’t come at a better time than now. We also have Demian Maia against Gunnar Nelson, Max Holloway against Jeremy Stephens…Urijah Faber is on the card too. INSANE! Jose Aldo and Conor McGregor will be epic and this is all because of Conor McGregor. Jose Aldo is a great fighter and one of the pound for pound greats, but has never elevated a card based on that. Conor McGregor is very eccentric and witty in his approach to talking smack and happens to be dam good fighter. He makes you want to either watch him continue to make history or watch him finally fall…either way you’re watching! I think this is the best thing to happen to Joe Aldo, he found his Joe Frazier. As for the fight, man it’s honestly a toss up like the odds and probably most people believe. Stylistically, this is a better fight for Conor McGregor due to the belief that it should remain standing, which is his strength. Jose Aldo though and rarely seeing it, is a solid grappler and I’m confident he can get this to the mat. Will that be his gameplan? Who know’s? I actually think though that McGregor did himself a service talking smack because it could have Aldo wanting to knock him out on the feet, exactly where McGregor wants it to be. He has the height and reach advantage, physical aspects he has used to his advantage thus far. The one thing I’ve seen however, is he actually has shown to be hittable, despite so far being able to eat a punch. Siver and Mendes both tagged him, none of which he seemed fazed about, but Jose Aldo is a different animal than those guys. He will hit you with two punches and leg kick before you know it. Gosh, I’m done trying to act like I know what’s going to happen and just give you the prediction. Jose Aldo via TKO, leg kicks and takedowns to soften him up first though. I was going to break down the Chris Weidman against Luke Rockhold fight, but I’m more excited to watch than write at this point! So, as for the rest of the card, I’m going to be brief! 185 lbs. : UFC Middleweight Champion Chris Weidman vs. Luke Rockhold – Stylistically this is a dead even fight, but I’m siding with Weidman due to his rising confidence and champion mentality since defeating one the greatest of all time in Anderson Silva twice. 185 lbs. : Yoel Romero vs. Ronaldo Souza – A toss up, but what happens when Romero is on his back or Souza’s guard…not good things in my opinion. 170 lbs. : Demian Maia vs. Gunnar Nelson – Until anyone shows they are better than Maia grappling, I won’t pick against him against a fellow practitioner. 145 lbs. : Max Holloway vs. Jeremy Stephens – Holloway will pick apart a tough and durable Stephens, just like Bermudez did…minus getting KO’d late. 135 lbs. : Urijah Faber vs. Frankie Saenz – Saenz’s last fight wasn’t impressive and Urijah Faber despite getting older, is almost undefeated in non-title fights. 115 lbs. : Tecia Torres vs. Jocelyn Jones-Lybarger – Torres brings volume striking and explosiveness to the table here, which will get it done here. 170 lbs. : Warlley Alves vs. Colby Covington – Covington is a top notch wrestler, who will probably look to wear down Alves in route to a decision. 155 lbs. : Kevin Lee vs. Leonardo Santos – Lee is a stud and will continue his winning ways by beating up Santos anywhere this fight goes. 155 lbs. : Magomed Mustafaev vs. Joe Proctor – I like this fight, but Mustafaev is a finisher with immense power in his hands. 155 lbs. : John Makdessi vs. Yancy Medeiros – Medeiros is extremely hittable and Makdessi is technical and precise, I smell Knockout. 170 lbs. : Marcio Alexandre Jr. vs. Court McGee – McGee has a knack for winning fights, even if they aren’t pretty.